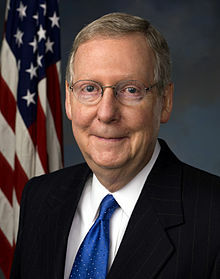 Mitch McConnellYesterday, despite having support from a majority of the Senate, the $60 billion Rebuild America Jobs Act was blocked from even being debated on the floor of the Senate by Kentucky’s own Mitch McConnell and Rand Paul – along with every other Republican senator. The Act included $50 billion in direct spending for roads, bridges, and other infrastructure, as well as $10 billion towards starting the National Infrastructure Bank. Both ideas have traditionally enjoyed bipartisan support. The bill would be paid for by a 0.7% surtax on incomes over $1 million. The Department of Transportation estimated that the Act would create about 800,000 new jobs. 800,000 jobs seems like more than a campaign message. But these national numbers are a bit hard to get our arms around. It’s worth evaluating the impacts of this bill on a more local level. What would the Act do here in Kentucky? Over 200,000 Kentuckians are out of work. That’s nearly 10% of the labor force. And since September, one of two major bridges crossing the Ohio River in McConnell’s hometown of Louisville has been shut down after inspectors found cracks. Another bridge between Kentucky and Cincinnati has been deemed “structurally deficient”. 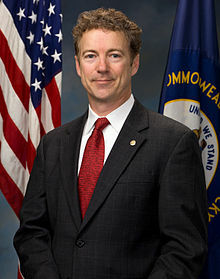 Rand PaulThe bill McConnell and Paul voted against would have spent over $450 million on roads and bridges in Kentucky, and would have created 5,900 jobs. Why would Mitch McConnell and Rand Paul reject 5,900 jobs for Kentucky? Why would they oppose fixing Kentucky’s infrastructure? Maybe they’re concerned with raising taxes. As McConnell said on Meet the Press, “We don’t want to stagnate this economy by raising taxes” on those who make over $1,000,000, who Republicans are fond of calling “job creators” and “small business owners”. So let’s take a look at who makes over $1,000,000 in Kentucky. According to Citizens for Tax Justice [PDF Link via Greg Sargent] out of Kentucky’s 4.3 million citizens, there are 1345 Kentuckians who would be affected by such a tax, and they make an average of nearly $3.5 million. And it’s worth noting that The 1345 are folks who don’t just have $3.5 million – enough to qualify them as multi-millionaires. These are people who clear $3.5 million per year. The 1345 are the ultra-wealthy. And businesses which help their owners reap $3.5 million per year are not ordinarily considered “small”. And what is the onerous burden the “millionaire’s tax” would place on The 1345? Out of their $3.5 million in income, The 1345 would pay $17,409 more to fix Kentucky’s roads and bridges which they undoubtedly benefit from more than Kentucky’s other 4,338,000 citizens. So: McConnell and Paul blocked the creation of 5,900 jobs and the improvment of roads and bridges for all Kentuckians in order to protect The 1345, a tiny group of ultra-wealthy Kentuckians who would pay only $17,409 to rebuild the infrastructure they use more than anyone else. McConnell claims he doesn’t want to “stagnate the economy” by taxing The 1345, which raises the question: What have these ultra-wealthy “job creators” been doing with this money while they’ve kept it? Because they certainly haven’t been creating jobs. Mitch McConnell and Rand Paul chose to protect The 1345 at the expense putting 5,900 Kentuckians back to work. At the expense of our crumbling roads and bridges. At the expense of the other 4,338,000 Kentuckians. And frankly, the American people – and Kentuckians – deserve a lot better than that.